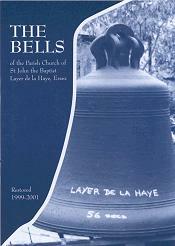 The parish has published a booklet (cover shown on right) about the history of the Layer de la Haye Bells and their restoration. Attractively produced with several photographs it is priced only £2-50 (p & p extra). All profits go towards the upkeep of the bells. In 1969, when Canon James Allen was the incumbent, an inspection of the bells was carried out by Whitechapel Bell Foundry and an estimate supplied for rehanging the bells. No further action was taken at the time. 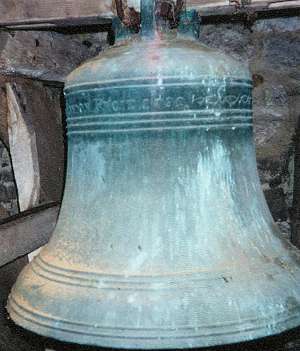 When writing a history of the church Canon Allen noted "...the bells have been chimed only by means of ropes which reach to the floor of the tower. Is it a pious hope that one may once again hear these bells properly rung?" 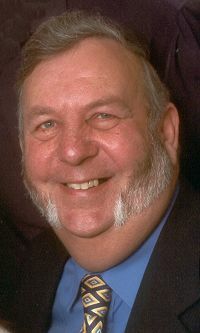 During the Revd John Sibson's time as Vicar in the 1980s Brian Keeble, a member of the Essex Association of Change Ringers (EACR), moved into the parish and became a member of the Parochial Church Council. Further enquiries were made about the bells and an inspection was undertaken by the EACR's Technical Adviser. A bell fund was started, helped by a generous bequest from the late Donald Oxton who was for many years a faithful member of the church, a member of the PCC, and a Churchwarden. Again, it was not possible to take any further action on the bells at the time. The desire of many people to get the bells back into ringing order gathered momentum during the 1990s. The bell fund continued to grow slowly and the restoration of the bells started to feature regularly on the PCC's agenda. In 1997 there was an opportunity to apply for a Millennium Grant which made the project look achievable. Although a Millennium Grant was not forthcoming, the support from the village and elsewhere encouraged the PCC to proceed with the restoration as a very fitting project to mark the new millennium. An initial survey revealed the mediaeval wooden bell frame was no longer usable. Removal of the frame was not an option because of its great historic interest. These factors made the project much more involved and expensive than it might otherwise have been. The only solution was to construct a new frame under the original. This in turn necessitated the construction of a new ringing floor so that the ground floor of the tower could continue to be used as a clergy vestry. 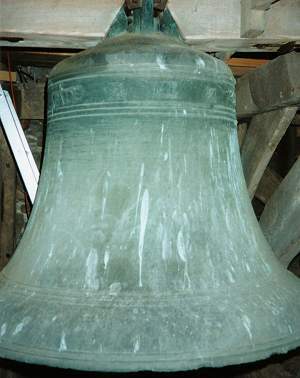 All this was additional to work required on the bells themselves, one of which was cracked (the Tenor - now successfully repaired using a specialist welding technique), and the provision of new fittings. The original bells are removed for refurbishment. In 1999 the bells were removed into storage and major structural work commenced to accommodate the new bell frame and ringing chamber. Originally it was hoped the work could be completed in time to ring in the new millennium. That was not to be. The bells and new frame were delivered to Layer de la Haye in December 2000 and installation of the frame began on the 28th of that month. The rehanging of the bells on all new fittings was carried out during January 2001, with the bells being rung for the first time on Friday 26th January 2001 by a team of experienced EACR ringers. On Monday 5th February the parish's own team of ringers, who had been practising in other towers since 1997, were able to enjoy the first practice in their own tower. The main contractor for the bell work was Hayward Mills Associates of Radford, Nottingham. The Essex Association of Change Ringers has been very supportive of local efforts throughout. Their advice, knowledge and substantial help has proved invaluable. Their generosity was crowned with the gift of a new bell, made possible by a bequest from the Lufkin family, so we now have a peal of six. Details of the new bell and the five old bells appear below. On the evening of Sunday 18th February 2001, the church was filled to capacity for a special service at which the Bishop of Chelmsford, the Rt Revd John Perry, dedicated the new and restored bells and commissioned ringers. During the service one of the lessons was read by a member of the Lufkin family. The Master of the EACR, Mr Stephen Nash, presented the Vicar with a cheque for £4,000 towards the cost of the restoration, £3,500 being a grant from the Association and £500 being a further gift. the restoration of Layer de la Haye's church bells. Photograph courtesy of the Keeble family. Much of the credit for driving forward the project must go to the late Brian Keeble, without whom it is questionable whether it would have happened at all and certainly not as quickly. In addition to all the work of co-ordination, this keen bell ringer and stalwart of our church spent substantial time and effort on the actual physical work involved and encouraged others to help with it. We would like to express our appreciation and thanks to all who supported our project. Ringing practice is normally on Monday evenings at 7-00pm. New ringers are very welcome, as are visiting ringers. Tower Captain: Mr Martin Piper. You can email our tower at layer-de-la-haye@eacr.org.uk. The newest bell in the tower is called the Lufkin bell, after the late Frank Lufkin who was Master and a Life Vice-President of the Essex Association of Change Ringers. The bell was donated to Layer de la Haye by the Essex Association, the cost being met out of a bequest it received from the Lufkin family. Founder: John Taylor Bellfounders Ltd of Loughborough. Taylors are the largest bellfounders in the world and a small party of parishioners travelled to Loughborough to witness the casting. Date: Thursday, 28th September 2000. Weight: 4 cwt 2 qrs 22 lbs. Inscription: 'The Lufkin Bell donated to Layer de la Haye by the Essex Association of Change Ringers'. Founder: Thomas Mears I of London. Weight: 4 cwt 3 qrs 27 lbs. Founder: Thomas Gardiner of Sudbury, Suffolk. Weight: 4 cwt 1 qrs 23 lbs. Founder: Miles Graye III of Colchester (a descendant of Miles Graye who cast the Tenor bell). Weight: 5 cwt 3 qrs 10 lbs. 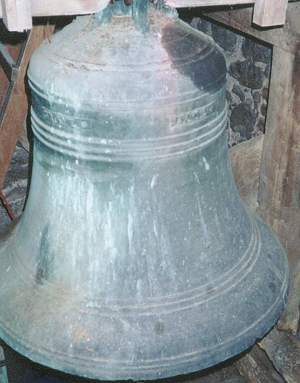 The oldest bell in the tower. Founder: Johanna Sturdy of London whose husband John, a renowned London bellfounder, died in 1458. Date: Between 1458 and 1461; believed to be 1459 but this is unconfirmed. Weight: 10 cwt 2 qrs 14 lbs. 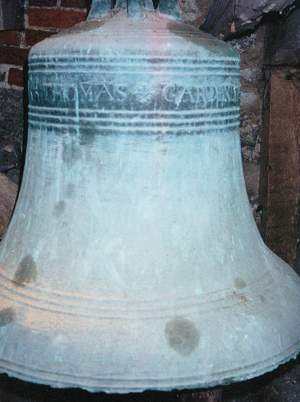 Latin Inscription: 'In Multis Annis Resonet Campana Johannis' (English: May John's bell ring for many years). 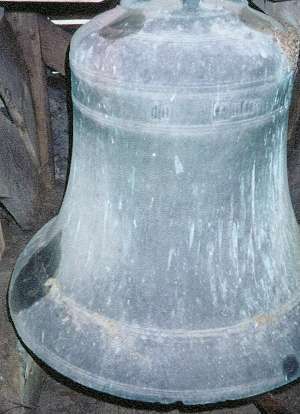 The largest bell in the tower. Founder: Miles Graye I of Colchester (grandfather or father of Miles Graye who cast Number 4). Weight: 10 cwt 3 qrs 22 lbs.